Bring a little green into your office for better indoor air quality. What a fun way to do this! See how smartstrand carpet holds up to a weeks worth of wear and tear from elephants, rhinos & camels. A terrific in-depth exploration of bamboo flooring, including details regarding harvest, manufacture, bamboo biology, installation options and more. You know bamboo is a beautiful design element but now get the rest of the story. Two sustainable materials used here, recycled paper countertop and bamboo plywood, with a little laser cut added, stunning design. Those homemade ice cream sandos look good too. Yum all the way around. 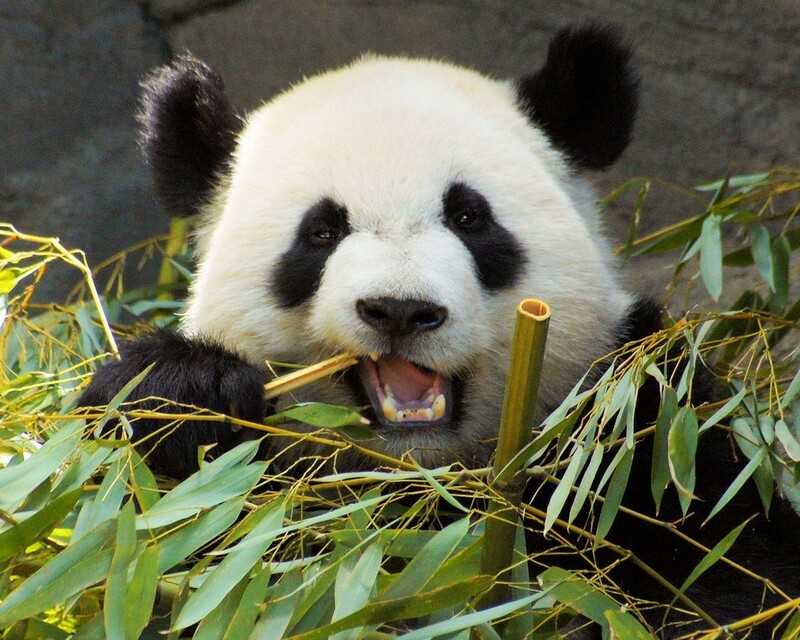 Cute and voracious eaters, a panda will mow through 12-38 kilograms of bamboo every day. There are 42 species of bamboo that make up the diet of Panda bears. What does this have to with Green Design? Bamboo products for your home are not going to put pandas out of business. 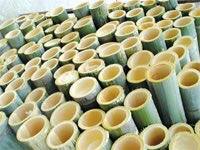 None of these types of tasty bamboo are used in the manufacture of bamboo flooring and panel products. Moso 9, or Phyllostachus Edulis, a large timber bamboo, is the material used for making these durable and beautiful products. Great for building material but not tasty to pandas. Why should you want bamboo for your project? Bamboo products offer you beauty and versatility in style, incredible durability and long life, and are made from sustainable, renewable bamboo. Harder than maple, easy to care for, you can feel good knowing that you’ve chosen a product that not only looks good but is high quality and eco-friendly. Not all bamboo products are created equal. Look for certifications on products you choose such as FSC-certified, carb compliant (in certain states) and make sure that glues and adhesives used have no-added urea formaldehyde (NAUF). Now let’s get to the good stuff. What does bamboo look like? Horizontal Grain, Vertical Grain and Strandwoven are the primary styles for bamboo. Style options include multi-width planks from 3.25" to 7" or wider and lengths from 36" to 72", with flush joints or beveled edges and hand scraped surfaces. Finish is aluminum oxide, the same finish used on conventional wood flooring, or a natural, oil finish. Bamboo can be natural color or carmelized or a combination of the two. To creat the carmel, or carbonized color, bamboo is heated up until the natural sugars in the material turn carmel color. Natural and carmelized strands can also be woven together to creat the popular Tiger Strandwoven style. The new generation of bamboo flooring has introduced stained and dyed products from modern grays to antiqued, rough hewn port color and more. Whatever your style, traditional, contemporary, anything in between, the versatility of bamboo can lend elegance, style and a “green” luster to your design. Bamboo flooring is suitable for installations of all types—on slab, on grade, below grade, over a raised foundation—the key is to select the right profile for your installation. Bamboo can be stapled, glued or floated and comes in solid, engineered, click and drop and lock formats. Be sure to shop with a knowledgeable flooring dealer and/or flooring installer or contractor to make certain you select the right profile for your project. Bamboo floors can be cared for just as a wood floor would be. Regular sweeping with a microfiber duster or a canister vacuum with a hard floor attachment and occasional cleaning with a microfiber mop and spray floor cleaner such as Bona is all that is required. Design your own bamboo door at www.greenleafdoors.com. This video explains how easy it is. Susanne from Unique Carpets LTD. stopped in today to show us some awesome new shag wool carpet. Biodiversity in the cork forests of Spain and Portugal is second only to the Amazon and Indonesian rain forests – over 13000 endemic species! Listen as Patrick Spencer from the Cork Forest Conservation Alliance shares a few facts about cork that you might not know. A list of ways to share the love with everyone you adore without hating on the environment.